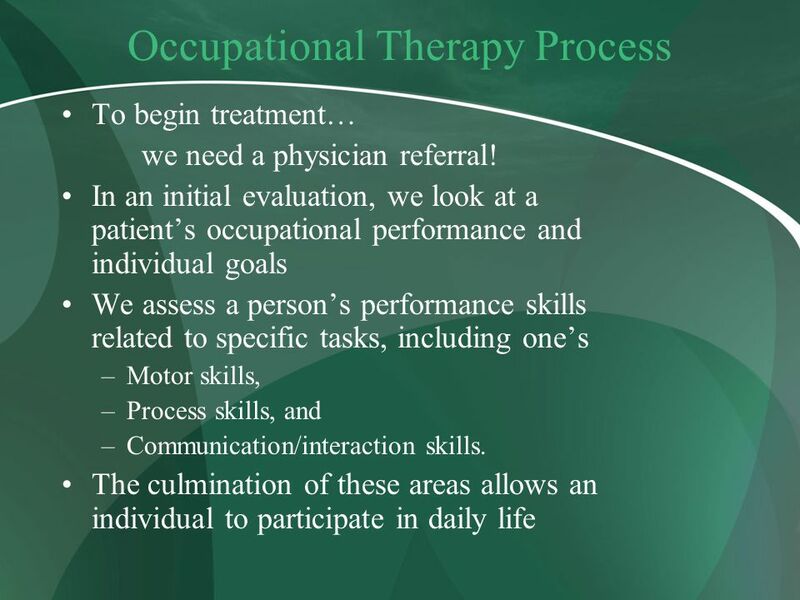 Occupational Therapy 101: What Is OT? 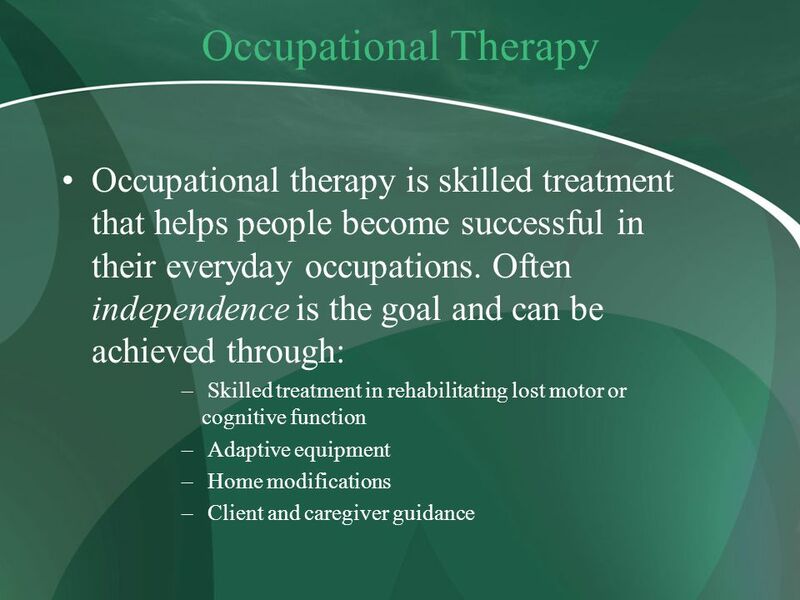 1 Occupational Therapy 101: What Is OT? 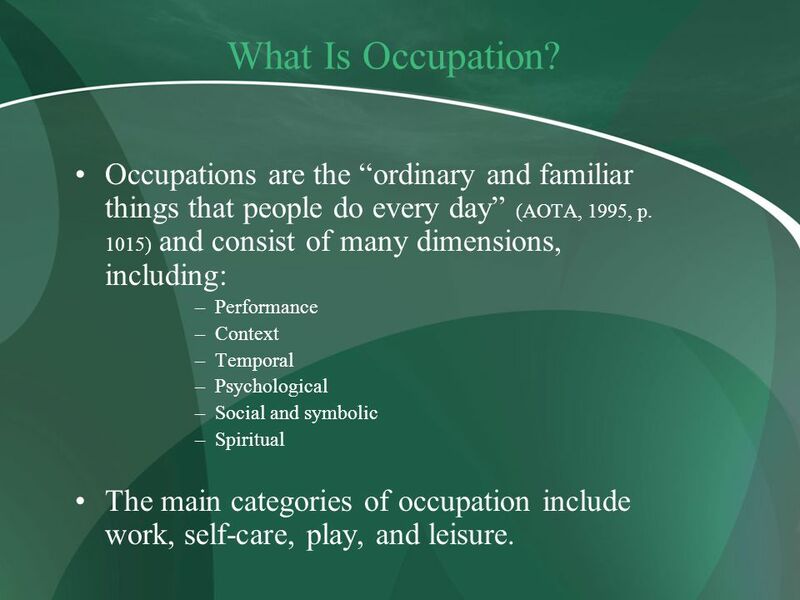 2 What Is Occupation? 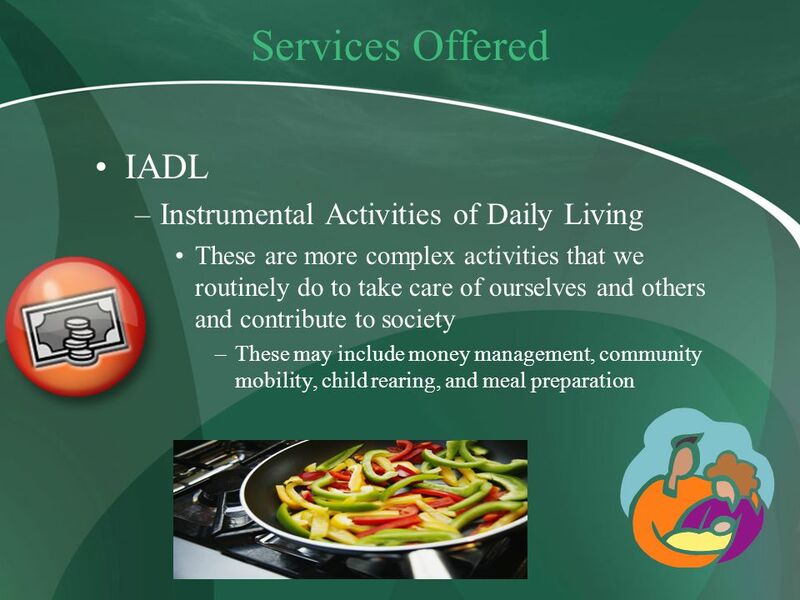 Occupations are the “ordinary and familiar things that people do every day” (AOTA, 1995, p. 1015) and consist of many dimensions, including: Performance Context Temporal Psychological Social and symbolic Spiritual The main categories of occupation include work, self-care, play, and leisure. 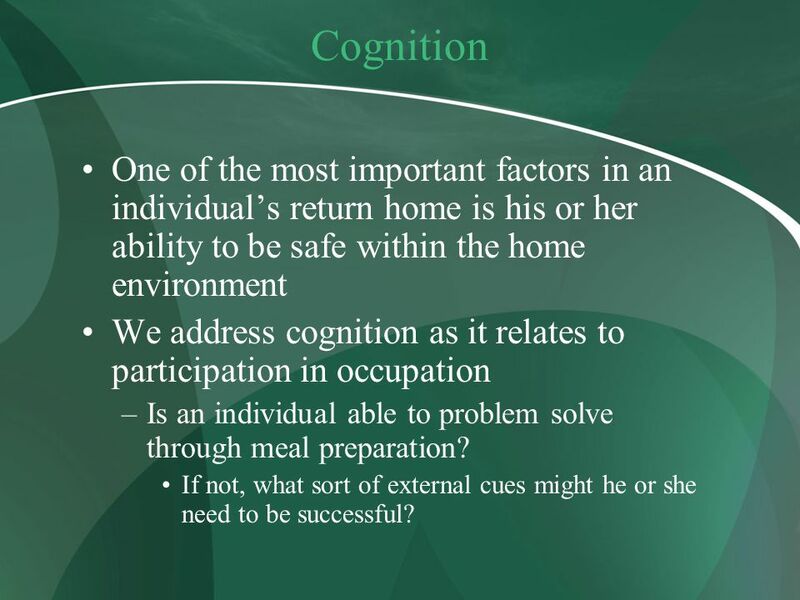 10 Cognition One of the most important factors in an individual’s return home is his or her ability to be safe within the home environment We address cognition as it relates to participation in occupation Is an individual able to problem solve through meal preparation? 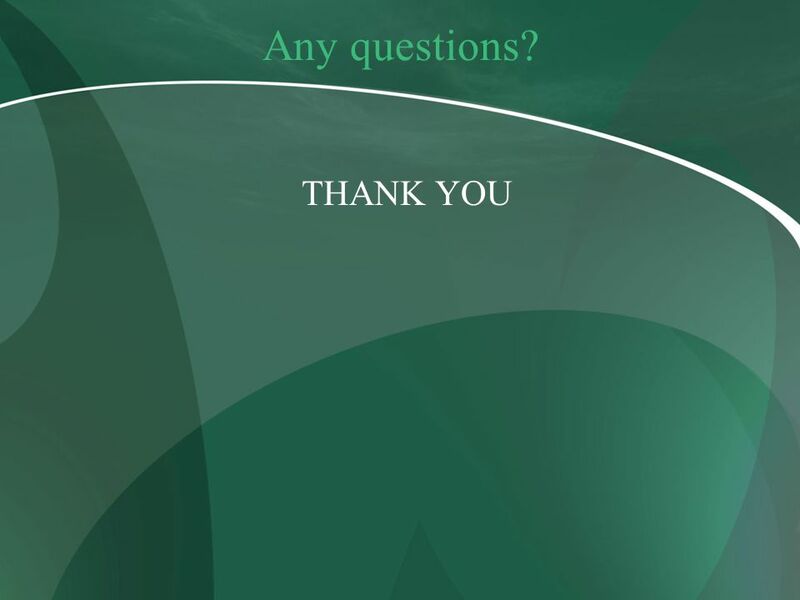 If not, what sort of external cues might he or she need to be successful? 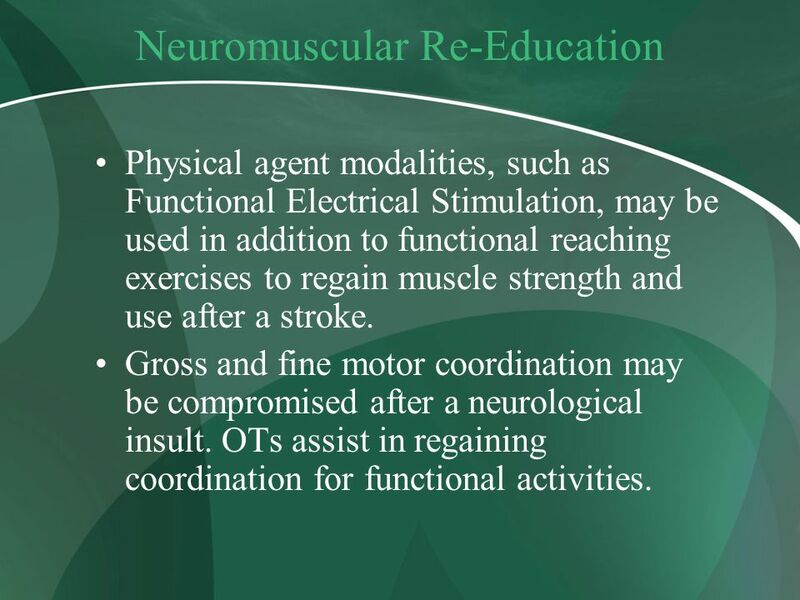 Physical agent modalities, such as Functional Electrical Stimulation, may be used in addition to functional reaching exercises to regain muscle strength and use after a stroke. Gross and fine motor coordination may be compromised after a neurological insult. 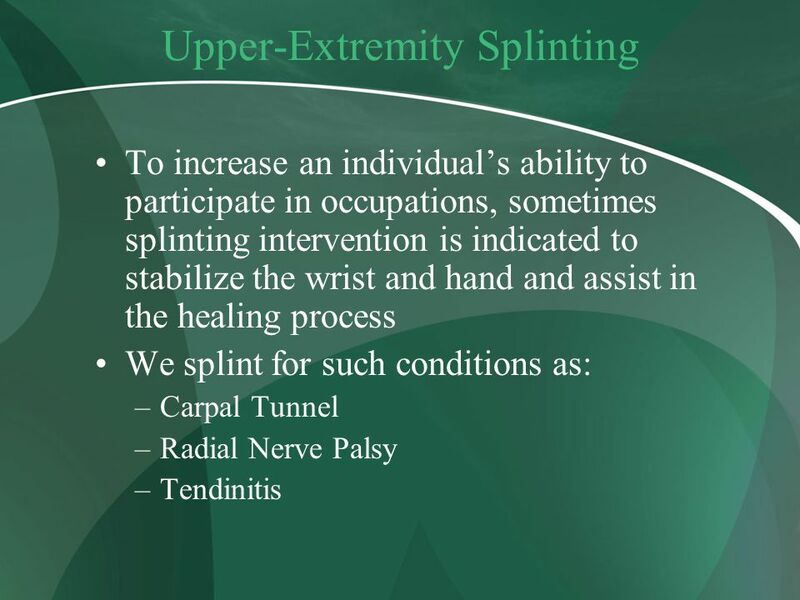 OTs assist in regaining coordination for functional activities. 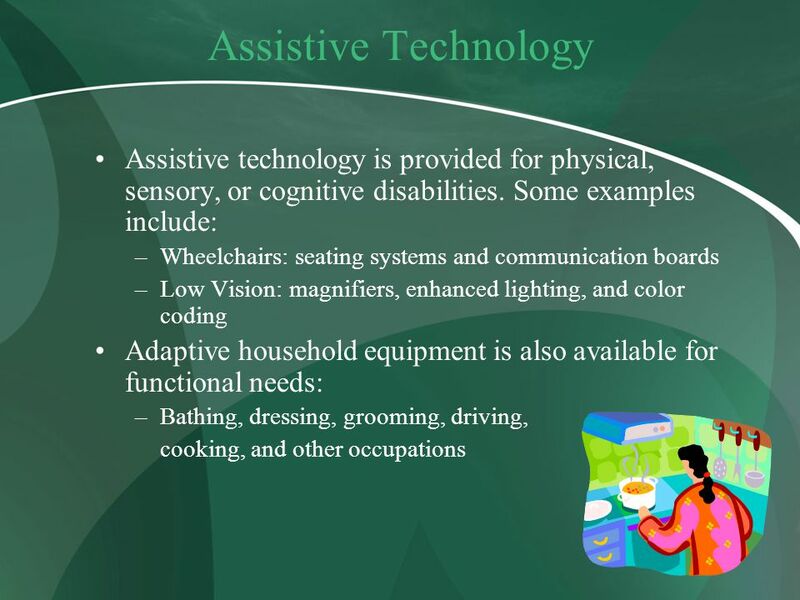 24 References American Occupational Therapy Association. (1995). Position Paper: Occupation. 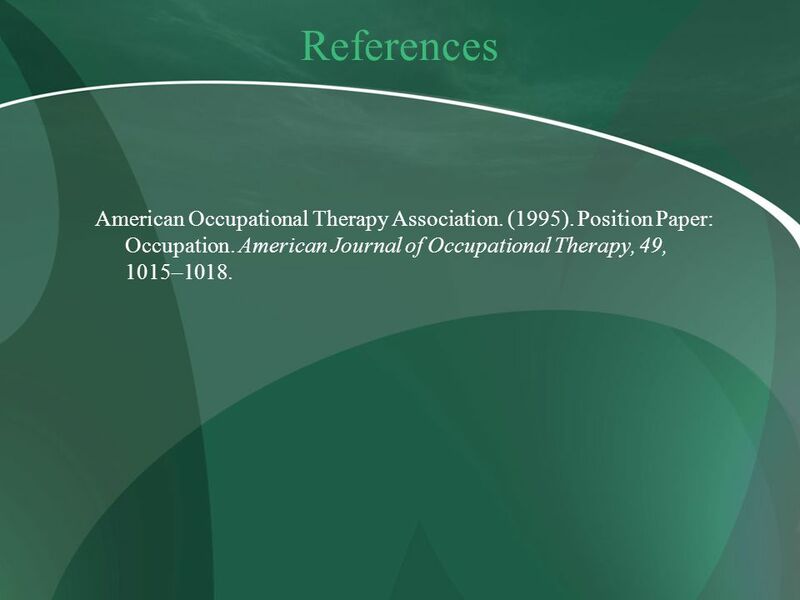 American Journal of Occupational Therapy, 49, 1015–1018. 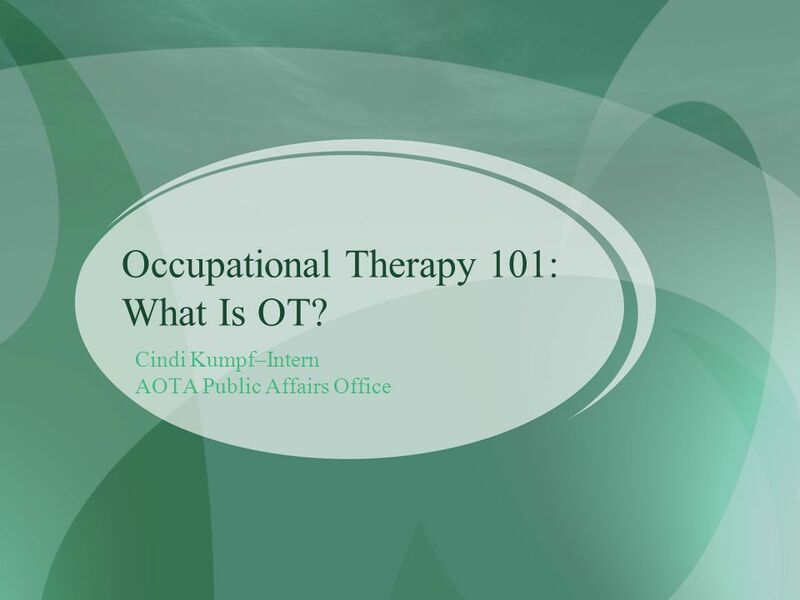 Download ppt "Occupational Therapy 101: What Is OT?" 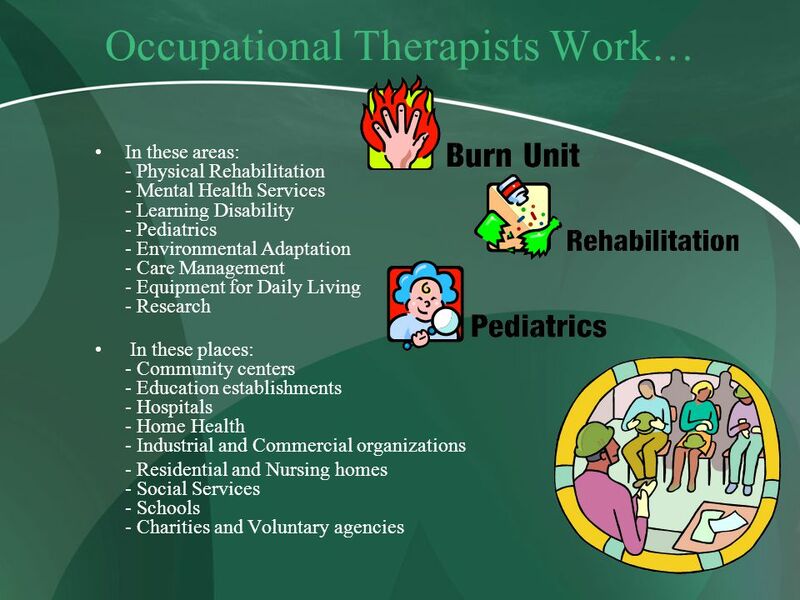 Role of Occupational Therapy with Children and Youth in School-Based Practice. 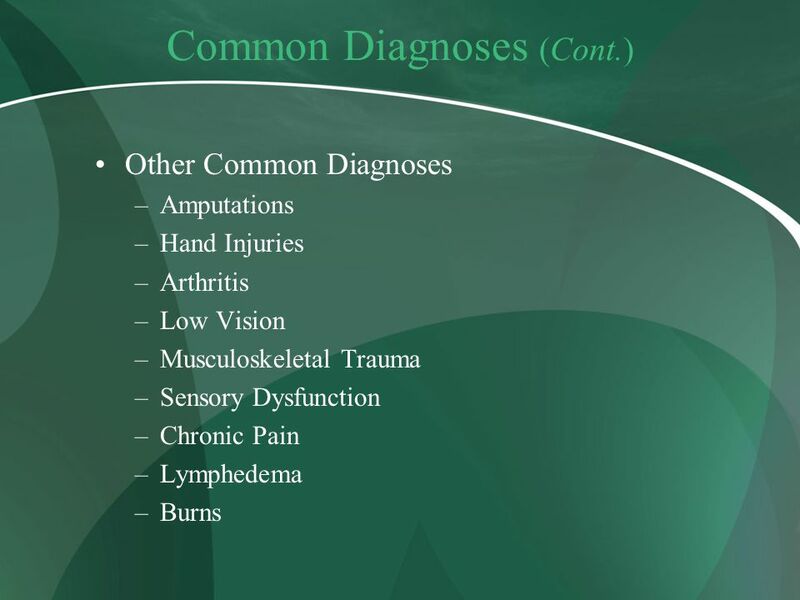 The ABC’s of Pediatric Physical Therapy The Section on Pediatrics American Physical Therapy Association The Section on Pediatrics American Physical Therapy. 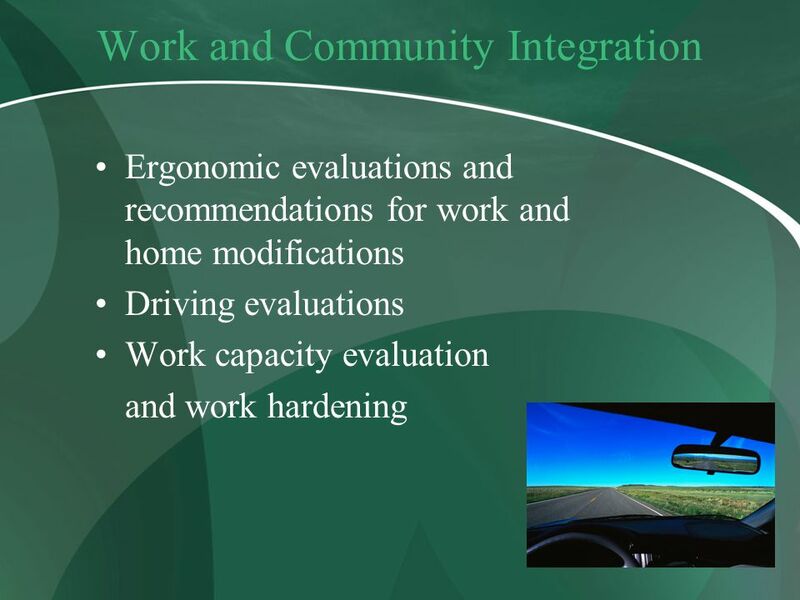 Improving Function and Quality of Life Through Occupation: The Role of Occupational Therapy in Recovery Presented by: Sean M. Getty, MS, OTR/L Rehab Director. 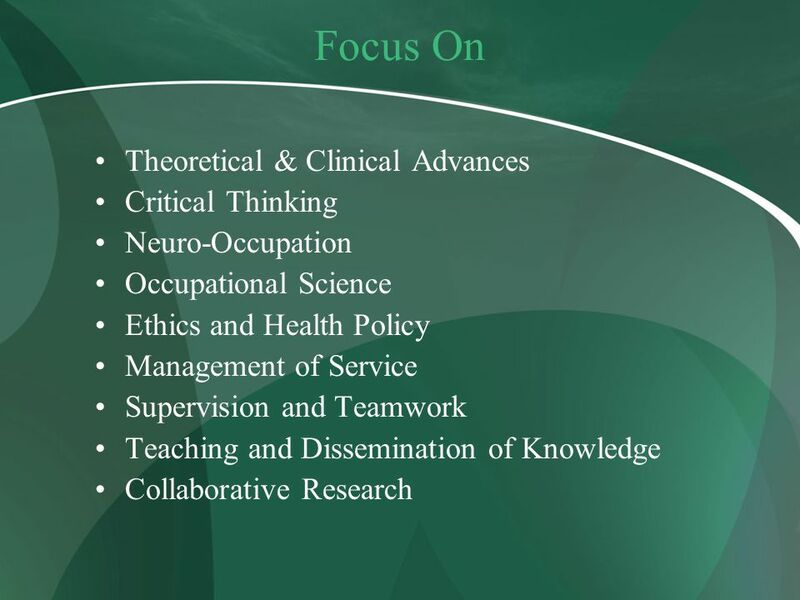 Faculty of Health & Social Care Occupational Therapy Dawn Mitchell Subject Lead for Occupational Therapy 2014. 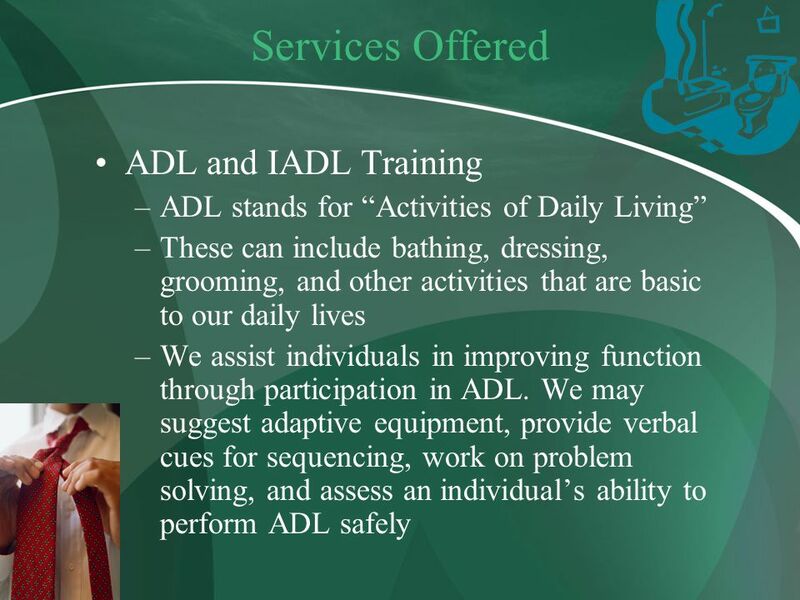 Activities of Daily Living Skills for the Job of Living. 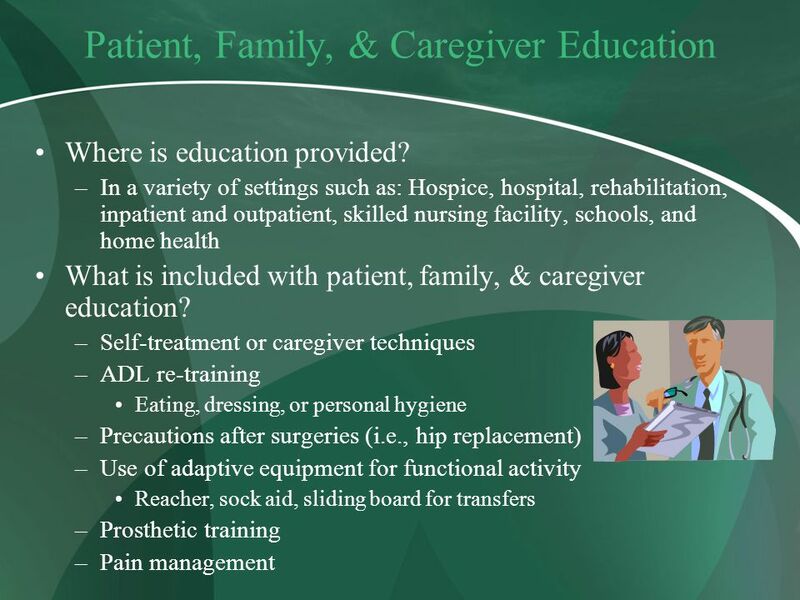 Restorative Care Chapter Copyright 2004 by Delmar Learning, a division of Thomson Learning, Inc. Restorative Care  Takes place in many types. Jewish Rehabilitation Hospital October History Opening of the Jewish Convalescent Center The Center changes its name to Jewish Convalescent. 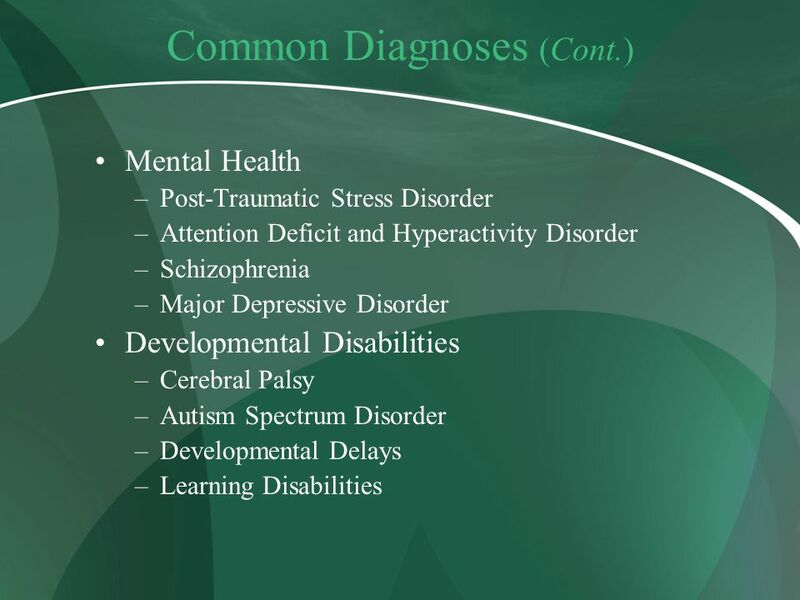 1 Autism Commission Presentation January 24, 2011 Lisa McDowell, Director of Institutional, Residential & Day Services MassHealth Office of Long Term Care. 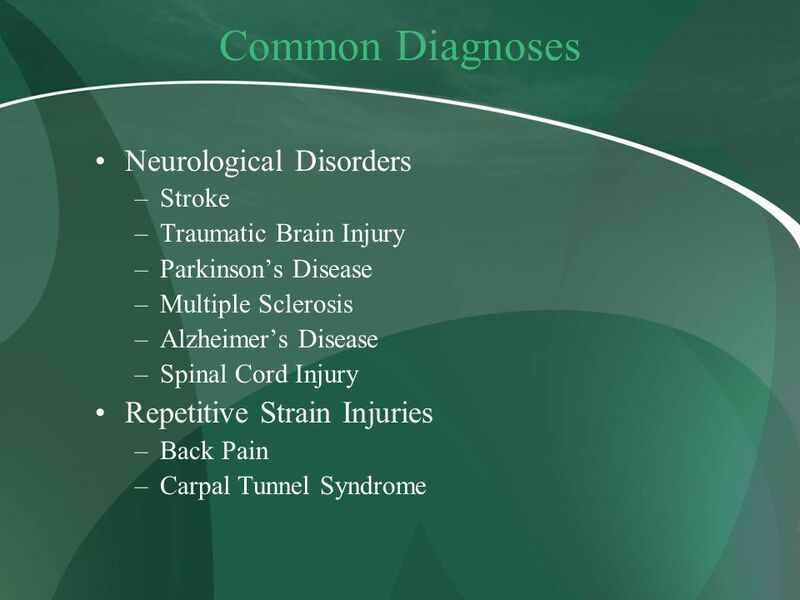 The Medical System. 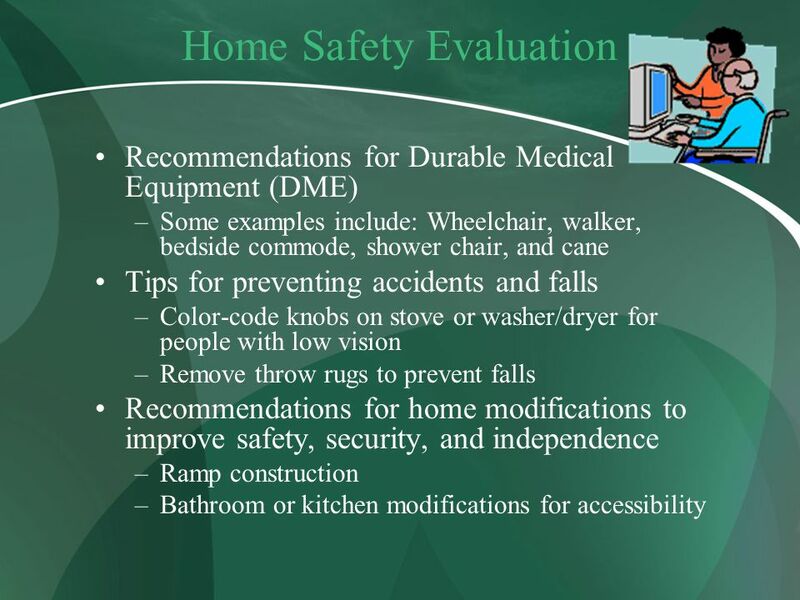 The Health Care System This includes all available medical services, the ways in which individuals pay for medical care, and aimed. T HERAPEUTIC E XERCISE KNR 164. W HAT IS T HERAPEUTIC E XERCISE ? 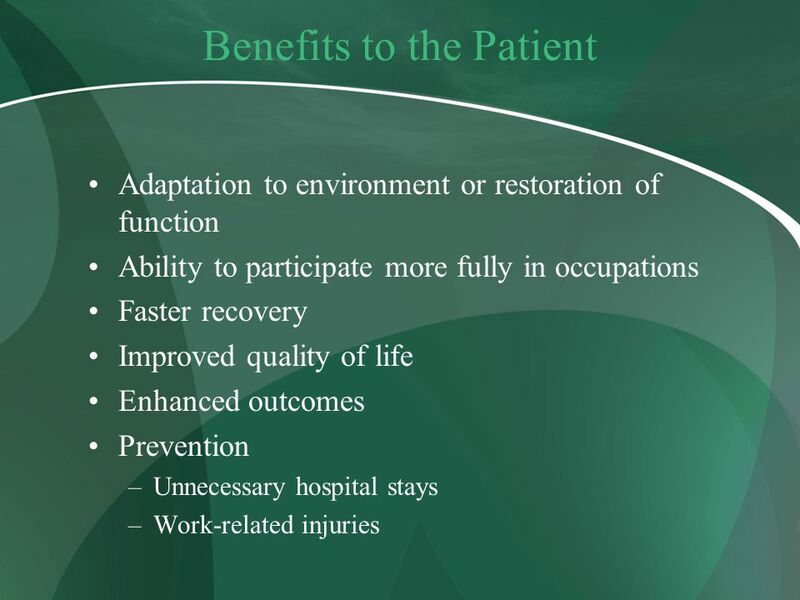 Therapeutic Exercise: is the systematic and scientific application of exercise and movement. 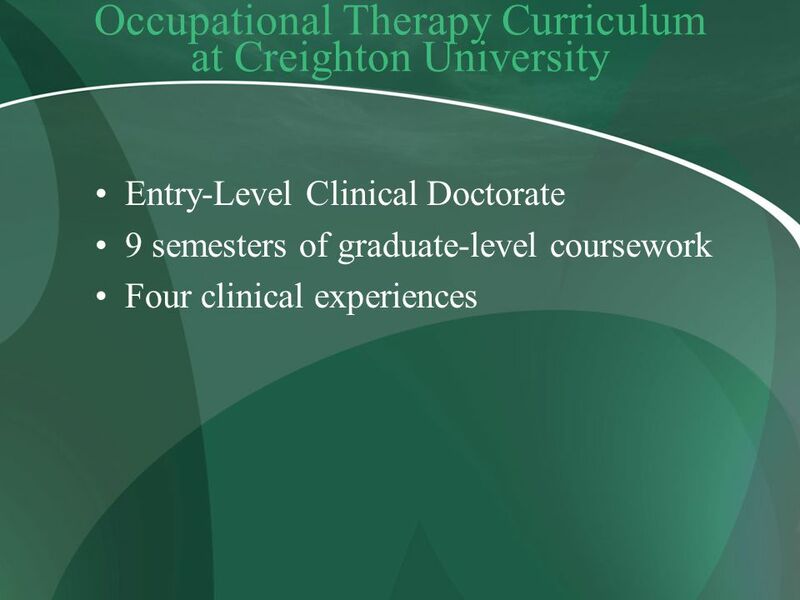 Physical Therapy A Guide for Aspiring College Students Created by: Kyle Norman. 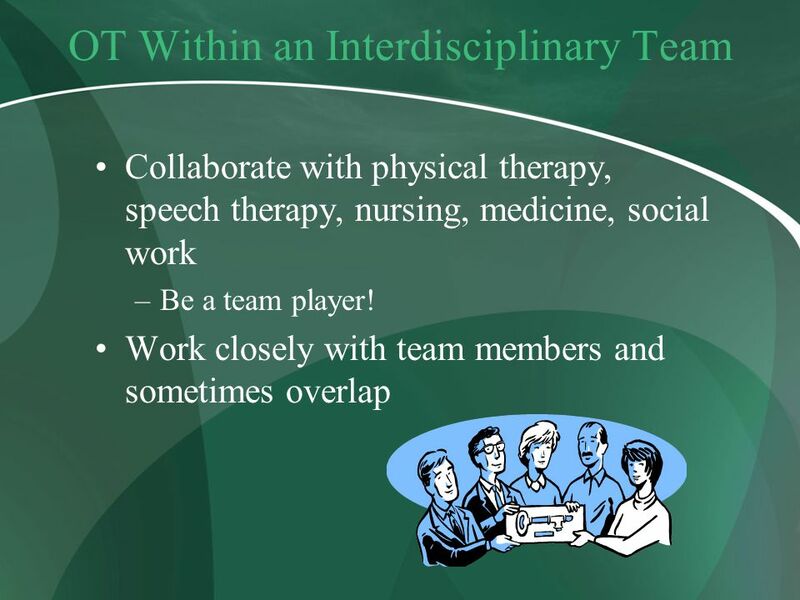 Intake Team. Who are we? 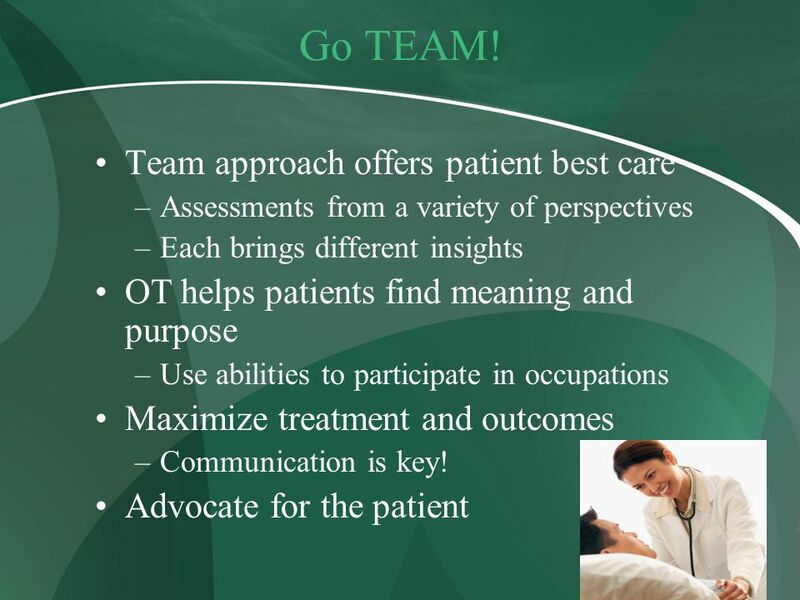 We are a team consisting of Social Workers/Social Care Co-Ordinators, Occupational Therapists and Social Care Officers. Sometimes.